Step into the world of Self-Service with Olea Kiosks at booth #1457. Interact with our lineup of kiosk solutions and learn why kiosks are being deployed worldwide at record-pace. Olea will also be showcasing part of our BRAND-NEW kiosk line, the Austin Series. Primed for QSR/Fast-Food, the modular solution is easy to drop into place and comes with everything you need to process cashless transactions in the most compliant and efficient manner. The lineup uses traditional POS devices which makes them a quick and welcome addition by your staff. The compact and elegant form factor keeps your brand at the cutting-edge of customer-pointed technology. Different configurations of our Austin Freestanding Kiosk will be on display throughout the show with Olea Partners. Stop by Shuttle Computer Group (#2754) and AOPEN America (#2912) to interact with additional demos and hardware options. Olea Kiosks is a self-service industry leader with over 40 years of design, engineering, and manufacturing experience. We offer off-the-shelf kiosks, as well as fully custom kiosks to meet the needs of your brand and unique customer-base. Some of the companies we work and worked with include Kaiser Permanente, FedEx, Nike, CLEAR, and more. Solutions for: Digital Signage, Wayfinding, QSR/Fast Food, Bill Payment, Check-In, Ticketing and more. Call 800-927-8063 or email [email protected] to learn more or to schedule a visit to our booth. 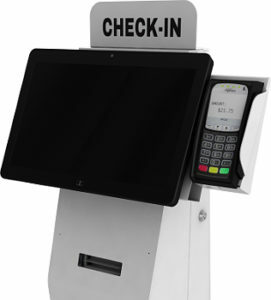 Sleek and modern the Austin Freestanding Check-In Kiosk can work in almost any environment. The Austin continues Olea’s mission to provide better kiosks through intelligent design. Providing flexible configuration options, the Austin was meticulously engineered to accommodate 15” or 22” All-in-One computers in Portrait or Landscape. Standard options include EMV terminal and POS-style receipt printer. The wide array of transactional components housed in this sleek, feature-packed kiosk makes it one of the most powerful retail solutions available on the market. Its compact footprint and rugged security complement a variety of environments for companies that seek to improve ROI and user interaction in small spaces or high traffic areas. Make an impact with the Milan kiosk. This stunning pedestal-style kiosk was developed for interactive digital signage applications, but due to its incredible adaptability, the Milan is well-suited for many other applications. Several high-grade digital-signage monitors built for 24/7, year round operation are available. 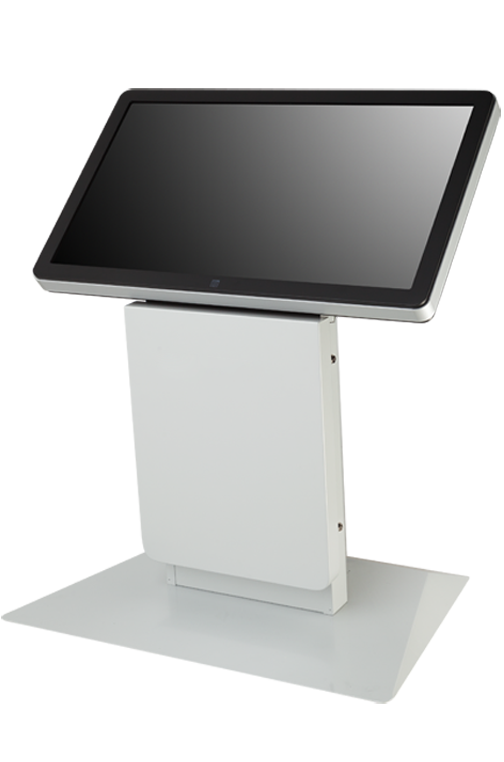 This best-selling kiosk can accommodate virtually any single or multi-touch LCD monitor with the option to orient the display to portrait or landscape mode. Larger monitors allow deployers to split the screen for multiple applications, such as retail and wayfinding. Performance on a pedestal, the Milan can be configured with a large variety of peripherals, including thermal printers, media players, magnetic and smart card readers, proximity sensors and QR/barcode scanners.